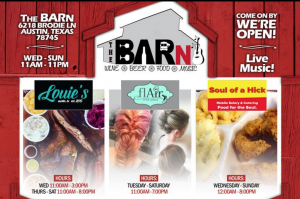 Today, Jan. 27th, I’m playing at The Barn in Austin, TX (See “Shows” for address). It’s Rustic bar & beer garden with food trucks, indoor seating & outdoor stage serving beer & wine! I’ll be there from 7pm-9pm! This entry was posted in Uncategorized on January 27, 2018 by Brittany.